North Conway shopping is a treasure hunter's dream come true. There's a myriad of factory stores at two outlet malls and a variety of specialty shops in the North Conway, NH, area featuring all kinds of merchandise from clothing and sporting equipment to jewelry and artwork made by New Hampshire artisans. With this many choices, you're bound to find a few special items to take home for your loved ones and maybe even treat yourself too! After a day of bargain hunting, come rest your feet in the comfy accommodations at the Inn. We'll have your room all ready for you! 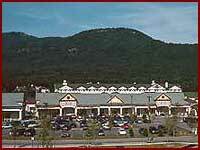 Settlers' Green Outlet Village - www.settlersgreen.com - There are over 60 name brand, first quality factory outlet stores located at Settlers' Green Outlet Village in tax-free North Conway, New Hampshire - a true shoppers paradise! Aaron Hats - www.getahaton.com - Many types and styles of headware, new and vintage, including professional sports caps, "fun" hats, crushable felts, dress and casual hats in straw, wool and fur felt, western hats, and custom air-brushed motorcycle, snowmobile, ski and bicycle helmets. Also carry accessories. "Get A Hat On." Dondero's Rock Shop - www.donderosrockshop.com - "Something for All Collectors." Dutch bloemen winkel - Flowers and accessories. On Reporter Court in the Village. League of New Hampshire Craftsmen - www.nhcrafts.com - One of seven League galleries throughout New Hampshire, featuring the work of juried craftspeople. Check out a talented young local, a glass blower, Nathan Macomber. See a sampling of his works at his studio website, www.macomberglass.com. North Country Whittler - Wood carvings sculpted by Joshua W. Sargent. In Madison. Ravenwood Curio Shoppe - Eclectic collection of art and architecturals for the home and garden, both new and old, many original. In Jackson. Sawyer River Trading Company - www.sawyerriver.com - Cookware and kitchenware products, featuring a complete line of Cuisinart® products. See the collection of premium sporting knives at www.sawyerriverknife.com. Spruce Hurricane - A unique mix of merchandise, following a family tradition. Including deerskin gloves and moccasins, woolen and fur coats, outerwear of other unusual fabrics and textures, and Native American art, pottery and jewelry. On Main Street across from the train depot. The Christmas Loft - www.christmasloft.com - Christmas all the year! One of their largest outlets, featuring an animated New England Christmas Village. Tuckerman Brewing Company - www.tuckermanbrewing.com - Guided brewery tours on Saturdays at 3pm. Home of legendary Tuckerman Pale Ale and Headwall Alt. On Hobbs Street in Conway. White Mountain Cider Co. - www.whitemountaincider.com - Cider mill, bakery, and country store. Newly added bistro. In Glen. Zeb's General Store - www.zebs.com - The quintessential New England general store. Zeb's offers literally thousands of items, featuring hundreds of New England craftsmen and cottage-based industries, in a store with the look and feel of the early 1900s.